There’s been a lot of buzz about the new American Express “Bluebird,” the latest major prepaid credit card in the ever-growing industry. What makes it such a big deal is that it’s a joint launch between the mighty Walmart and American Express. Talk about a one-two punch. But is it all it’s cracked up to be, and really the Green Dot slayer many think it is? Well, let’s take a look, shall we. Perhaps the biggest selling point to the new Bluebird prepaid card is the lack of fees. Many prepaid credit cards, such as Suze Orman’s Approved Card, are laden with fees for all types of actions, many of which are often a necessity. This makes them not such great deals. But Bluebird promises to be different, as it doesn’t charge an activation fee* or monthly or annual fees. You can get started for free at Bluebird.com, or at any Walmart store. If you choose the latter, there is a $5 charge for the account set up kit. Additionally, cardholders can deposit money for free in a number of ways, including via direct deposit and checking/savings account transfers, and even by depositing cash at Walmart registers. Cardholders can also withdraw money free of charge at the vast MoneyPass network of ATMs, which has 22,000 machines across the nation in places like Walgreens, Walmart, and even major banks like PNC and US Bank. However, you must be enrolled in direct deposit to use the ATMs surcharge-free. For customers not enrolled, the withdrawal fee is $2. If it’s an out-of-network ATM, the fee is $2 plus the ATM operator’s fee. Ouch. Even cash load packs are free in many cases, and if you lose your card, it will be replaced for free. Flanking the lack of fees are smart features, such as the ability to use Bluebird as a digital wallet and bill pay. In other words, you can send money to anyone with handy person-to-person (P2P) payments, all online or via your smartphone. You can also deposit checks remotely by simply taking a picture, instead of having to go to the bank or an ATM. Additionally, Bluebird is built on American Express’s digital payment platform Serve, which has all types of clever social ways of managing your money. There are also plans to add check-writing capabilities in the first quarter of 2013. You also get the legendary customer service American Express is known for, along with purchase protection, fraud protection, and even roadside assistance, just like typical American Express credit cards. 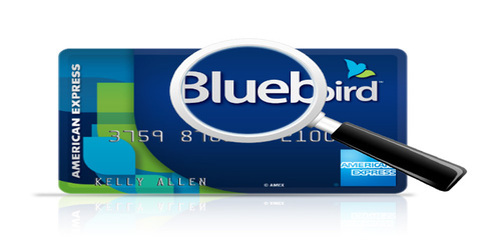 First off, the Bluebird card can only be used anywhere American Express is accepted. This isn’t everywhere. There are plenty of merchants that shun Amex for one reason or another, typically because of costly merchant fees tied to the card issuer. Their main competitor, Green Dot, is backed by Visa or MasterCard, which has much broader acceptance. AKA everywhere. But there’s an even bigger issue with Bluebird. It doesn’t have the capability to accept federal benefits payments, such as federal pensions, social security, military benefits, Medicare, unemployment, welfare, and disability payments. And per Bank Talk, a ton of Walmart customers fit the categories just mentioned. And because this group doesn’t change jobs, they probably won’t change cards. They also noted that Amex Bluebird doesn’t have FDIC insurance, unlike Green Dot, which insures amounts up to $250,000. Finally, there’s the question of whether Walmart customers want an American Express card, which has an air of pretentiousness to it. Oh, and you can’t withdraw money from Bluebird during point-of-sale transactions, such as at a Walmart cash register, which is another blow. So before you get too excited, make sure you compare the pros and cons of Bluebird versus other prepaid cards to see which will cost YOU the least, based on how you use your account. I don’t get it. Why is American Express offering another prepaid credit card if they already offer them. And what’s the difference between Bluebird and Serve from American Express? They look the same to me. Bluebird bills itself as a checking account alternative, aka bank account replacement. You can pay bills, deposit checks, order a checkbook, and there is no monthly fee via Bluebird. Serve seems to be a more basic offering that targets the youth, whereas Bluebird targets adults that want to manage their money more conveniently. Bluebird works great for me – I use it to pay my bills and I earn credit card points. It might be flawed for those people, but it’s great for manufactured spend! Previous Previous post: AirTrans Rewards Credit Card Review: Is It an A+? Next Next post: Are You a FICO Score High Achiever?